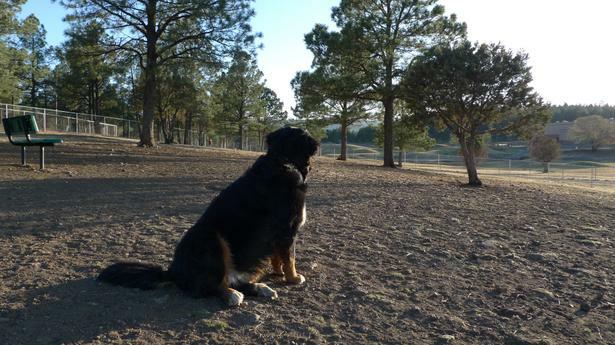 The Ruidoso Recreation and Park Commission has public dog park at the White Mountain Sports Complex as an off-leash dog area for you and your pet. Please help preserve a pleasant experience for all park users by keeping these areas neat and clean and following our new Village dog policy. Thank you! This park is located at the White Mountain Sports Complex at 685 Hull Road. Dogs must be leashed until safely inside the off-leash area and must be leashed upon exiting. Collars and rabies tags must be visible. Owners must clean up their dog’s waste and dispose of it in the provided trash receptacle. Owners must be present in the park while their dog is unleashed. Owners must carry a leash and remove their dog from the dog park at the first sign of aggression. Puppies younger than 4 months, unhealthy dogs and those in heat must be left at home. Limit of 3 dogs per owner. Children under 14 years old must be supervised by an adult. Please be sensible in supervising your children. If there are dogs present which are unknown to you, please consider changing your plans. Be considerate of others. Ensure your dog’s interaction is welcome. Village of Ruidoso Parks and Recreation Department at 575-257-5030 or use our online Report a Park Problem contact form. The construction of this dog park was donated to the Village by the Humane Society of Lincoln County. must be leashed upon exiting.